I am a full time college student and have a part time job, so as you can assume, I don’t have a lot of time in every morning to do the full pinup makeup and hair. I am a fairly new convert to the pinup style, so makeup and hair is sort of a challenge for me. I am wondering if you have any tips or advice to get ready in a flash on the mornings in which time is of the essence. Your advice will be greatly appreciated! This is going to sound like a strange thing to advise, but if you need to get ready quickly, put your mobile phone away! If you are like me and have your phone on you at all times, chances are a notification will distract you and if you have that happen multiple times, it can really start to mess with your timing. When I am running late or need to get ready in a hurry, I make sure I’m not checking my phone or hearing notifications! -Do as much prep the night before- set your hair in sponge rollers that will dry overnight so in the morning you don’t have to worry about setting it, just brushing it out or doing some victory rolls. -Get involved with fake hair! I LOVE my clip-in bangs and clip-in ponytail for quick looks or if my own hair isn’t behaving. -Make a hairstyle last a couple of days- if you do victory rolls one day, keep that hairstyle for the next day or two. You will need to re-roll and spray but your hair will remember it from the day before and it will be super quick and easy. -Don’t wash your hair too often. I only wash mine max twice a week but usually it’s just the once. I find that dirty hair (luckily mine doesn’t get too greasy, if yours does then get some dry shampoo) is far easier and quicker to get it into a style. -Focus on the essentials and what you want/feel comfortable having. If I am time pressured, I’ll do a tiny kitten liner which doesn’t take too long and still have time to focus on red lippy. -Makeup takes a little more precision and can be very tricky if you are stressed or rushing. I’d recommend doing makeup before your hair! -If you catch public transport, maybe you can finish your makeup look there. Do the main work at home and then finish off things like blusher on the bus. While your practising and learning, it’s probably best to just get up that little bit earlier and having the extra time to complete the look. You’ll be a lot less stressed out and there’s nothing worse than rushing to do liquid eyeliner! 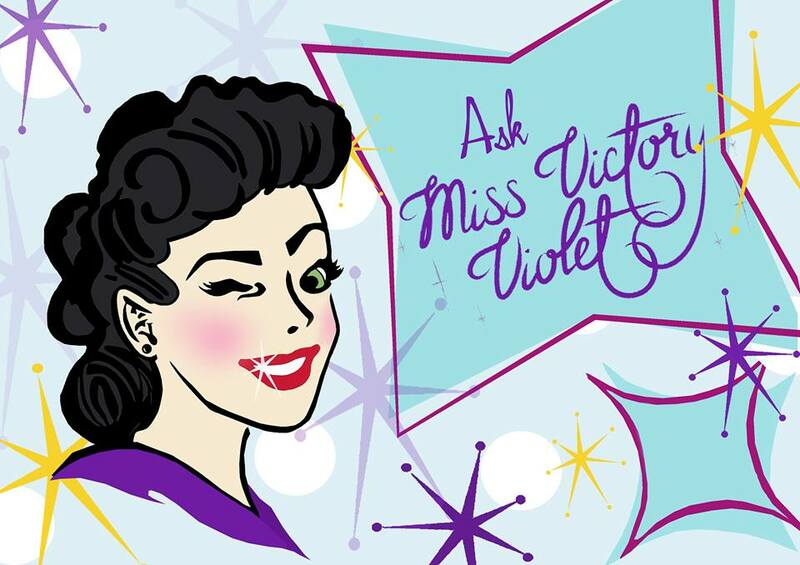 Submit your own question to Ask Miss Victory Violet here! Sometimes that’s all I do for makeup, plus a bb cream, which usually takes a minute or two to apply but gives me a bit of coverage. Sometimes I wear ONLY a red lip and no other makeup, and I feel fabulous. I am the worst with my phone, I swan around going through my phone like schedules don’t even exist. I really need to get in a habit of putting my phone away while I get ready in the morning.